The following pages are selected portions of a longer report on this website, The False Gospel in the Stars, which is an expose of the astrological signs that will be used by false teachers to validate the credentials of the Antichrist and False Prophet. Many of the current projections concerning the identities of these personages are in fact disinformation calculated to deceive the masses. Adding to the general ignorance, there is little information coming forth in the way of exposure of the Merovingian dynasty as the Satanic bloodline from which the Antichrist and False Prophet will come. Whatever lipservice is paid to this subject is usually tainted with enough misinformation to keep the masses of Christians ignorant of the truth. Yet the Bible presents specific evidence concerning the identities of the Antichrist and False Prophet, the Mark of the Beast, Mystery Babylon the Great and other entities that will be imperative for God’s elect to recognize during the Tribulation Period. We believe that New Agers already know the identity of the False Christ, the False Prophet and various other Tribulation counterfeits through their study of astrology, as interpreted by a large body of occult tradition and the current propaganda proliferating through New Age publications. There is no reason that Christians, given the same information available to New Agers, and aided by a right understanding of Scripture, cannot discern and rightly interpret this end-time enigma. The alternative is to be at the mercy of a massive disinformation campaign that is being conducted within the Christian community by the same New Age network which is planning the destruction of Christianity and return of mankind to the paganism of the ancient world. The Bistea Neptunis was worshipped in classical antiquity as the Roman god, Neptune, and as Poseidon in Greek mythology. Neptune was the mythological god of the sea who is said to have founded Atlantis, which is the pagan version of the pre-flood civilization which God judged in Genesis 7. Revelation 13:1, which identifies the Antichrist systen as “the beast that rises out of the sea,” becomes crystal clear upon discovery that a demonic bloodline which exists today that was originally sired by a mysterious “sea beast”—the Bistea Neptunis. Bloodline of the Holy Grail, Holy Blood, Holy Grail and The Da Vinci Code were popular books marketed for mass consumption and, as such, were propaganda tools which concealed the true origins of the Merovingian race. For their esoteric allusion to the Merovingians’ legendary progenitor, King Merovee, having been sired by a mysterious “beast of the sea” is a claim of literal Satanic descent. The demonic origins and history of the Merovingian Dynasty—also known as the Dragon Dynasty in honor the great red dragon of of Revelation 12 and 13—are revealed in less available insider sources such as Gardner’s Realm of the Ring Lords and “Kenneth Grant and the Merovingian Mythos” published by DragonKey Press. The Greek adaptation of Virgo, was Demeter, whose daughter Kore was abducted by Pluto, the god of the underworld. Kore would remain the dark lord's queen and her name would no longer be Kore, the maiden, but Persephone, "she who is to be feared". The Alexandrian Jews who worshipped the Greek goddess, Kore, managed to convert their pagan goddess worship into a theologically respectable tradition called Gnosticism by giving the goddess the trappings of Christianity. Although they worshipped her as the Holy Virgin, "virginity" has an altogether different connotation to Gnostics than it does to Christians. It is important to note that the heretic, Basilides, was an Gnostic Jew of Alexandria, as was his contemporary, the arch heretic Valentinus. In 412 A.D., Cyril of Alexandria became the Bishop of Alexandria. In Isis Unveiled, H.P. Blavatsky wrote: "...Cyril, the Bishop of Alexandria, had openly embraced the cause of Isis, the Egyptian goddess, and had anthropomorphized her into Mary, the mother of God..." (195:41, Vol.II) During his bishopric, Cyril wrote passionately and voluminously against the Nestorian heresy, and was largely instrumental in having it condemned at the Council of Ephesus in 431. The Third Ecumenical Council was held at Ephesus in Greece, whose philosophy and culture were, like Egypt, derived from the occult traditions of the pre-Flood civilization. The Council of Ephesus condemned the Nestorian heresy but approved the veneration of the Virgin Mary as "Theotokos" ---the God-Bearer or Mother of God. Nestorius and the Nestorians were exiled to the Persian Empire and become the Assyrian Orthodox Church of the East. However, in what appears to have been a classic dialectical operation, the path had been cleared for Mary to be transformed from the "Mother of God" to a deity in the image of the Mother Goddess, Isis, who shared in the divinity of her son, Horus. Even the trappings of monasticism that found a home in Roman Catholicism originated in the asceticism that was prevalent in Egypt, dating back to Hermes Trismegestis. Hermes or Thoth, a demi-god from the pre-flood civilization of Atlantis, became the prototype of the 'hermit' monk. The Council of Nicea in 321 A.D. may have been another dialectical operation. There St. Athanasius (296-373 AD), as Bishop of Alexandria, valiantly combated the Arian heresy which challenged the divinity of Jesus Christ. However, Athanasius also used that council as an opportunity to incorporate in the canons of the Church the requirement of celibacy for Christian leaders. (Catholic Encyclopedia: 548) Following his victory over the heresiarch Arius and the Arians, Athanasius traveled throughout Europe promoting monasticism and asceticism. He is credited with introducing monasticism specifically to the Romans and Germans. In the Gnostic theology of Athanasius, only ascetics were considered the Bride of Christ, a pernicious teaching which influenced many devout Christians to seek Christ in monasteries and convents. Although the religious orders had the outward appearance of spiritual piety, they were often, however, fronts for occult as well as homosexual/lesbian activity. That asceticism, enforced celibacy and monastic life have borne evil fruit throughout the centuries is evident in the rampant sexual perversion of the Roman Catholic priesthood and hierarchy. It was through the establishment of monasteries that the Merovingian Jews, whose forefathers were the Alexandrian Gnostics, began to infiltrate and mold the theology and practices of the Roman Catholic Church. Many of the popes were Merovingian monks who forced masses of European Jews to convert to Roman Catholicism., with the result that the Church incorporated traditions from both Judaism, the Talmud and the Kabbalah. (See: Mystery Babylon the Great: Catholic or Jewish?) We believe it will be from the monastic movement that the False Prophet, a Merovingian, will rise to prominence and power as the Antichrist's right hand man. The Society of Ormus would eventually relocate to Italy and, in 1070 A.D., move to territory in France owned by Godfroi de Bouillon, the first Grand Master of the Prieuré de Sion. There Ormus changed its name to the "Ordre de Sion" and the monks were given a tract of land owned by one Bernard of Clairvaux. St. Bernard, who was the founder of the Cistercian Order of monks, also wrote of the Rule of the Templars. According to Holy Blood, Holy Grail, the Society of Ormus, which became the Ordre de Sion, then became the Prieuré de Sion. In 1099, the Merovingian Jews in collusion with Pope Urban II, also a Merovingian, launched the First Crusade. An article titled The Merovingian Infiltration of the Christian World Through Monasticism confirms what we have long suspected, that Urban was not the first Merovingian pope, but the 6th in a succession of French Merovingian popes beginning in 999 A.D.
“It happens that Septimania (Languedoc) is exactly where the Jesus-Magdalene heresy flourished, and where there was a large population of Cathar Jews who were given independent status by Pepin, Carolingian King. Thence their own kings ruled as: 'seed of the Royal House of David', each acknowledged as 'King of the Jews', most famous of whom was Guillem de Gellone, the Prince of Orange. Confusing this issue, these kings also claimed to be of Merovingian descent ; but not confusing when one realizes that Jesus was of the House of David and Mary Magdalene was from the town Magdala, 4 miles from Tiberius, founded by Herod Antipas, who was an Edomite descendant of Esau with whom Benjaminites married. Additionally, Absolom, David’s son, who pulled a coup d’etat on his own father in an attempt to take his throne, had a rebel following who would have joined the Benjaminite cause. Absalom died when his long hair got caught in branches in the forest during the Coup. (2 Sam:18:9) And the Merovingians, first Dynasty of French kings, were the Long Haired Kings!! "By 1095, the members of the Rex Deus families group were almost certainly fully Christianised, yet each of them must have had at least one male member who held the traditional history of their high-born Jewish roots close to his heart. No doubt they saw themselves as 'super-Christians', descendants of the very first Church, and privy to the greatest secret this side of heaven. They were a silent elite — 'the kings of God'. "If the Rex Deus group did exist, it is easy to see how the First Crusade provided these families with a 'God-given' opportunity to return to their Holy Temple to recover the treasure that was their birthright - and it would be done at exactly the same time that the Jewish writer of the Gospel of John the Divine had predicted! The Rex Deus families were at the forefront of the First, and every Crusade. Medieval scholars have long wondered why it should be that the same families drove all of the Crusades for their entire duration, and now we had a possible answer. "According to members of the intelligence community, when the New World Order is solidified the relics will be taken out, will be united with the Spear of Destiny, and will, according to legend, give the world's ruler absolute power. This may confirm beliefs passed down through the ages that describe the significance of these relics when united in the hands of one man. It may also explain Hitler's desperate search for their hiding place during World War II. Again I must remind you that it makes not one iota of difference what you believe. If they believe, you will be affected. "The Knights Templar were founded sometime during the 11th century in Jerusalem by the Prieuré de Sion for the express purpose of guarding the remaining relics of Jesus and to provide military protection for the religious travelers during their pilgrimage to the Holy Land. "The nine Knights were sent out by Bernard the Cistercian; gothic was born at Citeaux. The whole gothic formula derives from the Cistercians and the 'Conipagnons des Devoirs'—heirs of the builders of gothic cathedrals—make no mystery that they derive their characteristic 'feature', their descriptive geometry, indispensable for the erection of gothic monuments, from the Cistercian Order. "1020. This was a notable epoch in Romanesque architecture; the epoch during which Christianity decked itself with 'a display of white churches'; for this was the time when after a labour lasting five centuries the Benedictine abbeys succeeded in constituting a corps, a lay brotherhood of builders, affiliated to the Order, to which they could appeal for protection if necessary. The Black Virgin was, in reality, Virgo, the Great Mother Goddess known to the Egyptians as Isis, who was christened in Alexandria as Mary Magdalene. According to The Cult of the Black Virgin, the full name of the Prieuré is the Order of the Prieuré Notre Dame de Sion. Former Grand Master of the Prieuré, Pierre Plantard de Saint Clair, has identified Notre Dame as Our Lady of the Light, i.e. Lucifer, the Light-Bearer. It was originally from Cain, whose descendants intermarried with the Nephilim, that the Grail race descended. Enki, the twin brother of Enlil, is merely an anagram of Cain, whose twin was Abel according to occult belief. "The mortal world spreads east and west and the land of le invisibles lies above and below it in the vertical dimensions of height and depths, north and south, Horus and Set.' This ties in with the Book of Enoch and the Hosts above and the fallen, banished Nephilim below. This also reminds us of the twins or brother gods in Sumeria called Enki and Enlil. Enki, the infernal of the two, represents Set and Enlil represents Horus (although in this context Enlil would also be Osiris.) In ancient mythologies names and stories can be switched and one god can also be an attribute of another. It's best to keep this in mind when studying this type of material. Set kills Osiris as Enki kills Enlil. As it has been shown in another article of this publication, Enki is associated with Cain, and Cain was a very bad boy. Enki was an infernal god that has been identified, in this publication, as siring the Merovingian race. Dagobert's Revenge recommends Tracy Twyman's "Dead But Dreaming: The Great Old Ones of Lovecraftian Legend Reinterpreted as Sumerian/Atlantean Kings" for information about the Atlantean gods, the Nephilim, who will rise again when the stars are in the right position. According to that informative article, the Nephilim preserved their occult traditions within the oath-bound secret societies which are now programming the younger generation to accept the Grail mythology as true. "Lovecraft, like Enoch, and like ancient man himself, conceived of the ancient Atlantean gods or Nephilim as possessing supernatural power, and, like Enoch, says that this power comes from the stars, that these beings in fact had come from the stars themselves, and seemed to be metaphysically affected by the movement of the stars, being able to resurrect from the dead only when the stars were in a certain position. "Likewise, the Atlantean god-kings purposely associated themselves with the stars and the planets, taking on the personifications of planets and constellations, each of which had a particular 'energy' or 'plain of existence' associated with it. This energy could be further manipulated by the prayers and rituals of the cult members who are loyal to the Great Old Ones, and wish to see their kingdom rise again, in much the same way that Masons, Rosicrucians and other occultists today perform rituals in hope of bringing about the 'Great Work' called the 'New World Order', a new Golden Age just like the one that covered the Antediluvian world when the Atlantean god-kings (whom they revere) ruled over the Earth directly. The Eye in the Pyramid on our dollar bill, which represents the New World Order, is clearly a symbol of this newly-risen kingdom of Atlantis, 'watched over' (as in 'the Watchers') by the All-Seeing Eye, which could just as easily be the eye of Dagon, or Leviathan, or Cthulhu. It even looks reptilian, like it belongs on the face of a dragon. Alice Bailey associated the Grail bloodline with the sign of Virgo: "Virgo itself is a cup-shaped constellation...; in its highest meaning the Holy Grail." Along with descent from immortal sea beasts, the Prieuré de Sion also alleges to have "incontrovertible proof" of Merovingian descent from Jesus Christ and His continuing bloodline, and has been working to reestablish the power of the Merovingian dynasty, this time over a world kingdom. However, even Baigent, Leigh and Lincoln have admitted, "while the Merovingian royal blood was credited with a sacred, miraculous, and divine nature, it was not explicitly stated anywhere that this blood was in fact Jesus." Claims of direct descent from Jesus—who is at best another Jesus, Yeshu, an Essene adept who saves by giving gnosis rather than shedding his blood—and Mary Magdalene (the holy grail or womb which bore this other Jesus' children) are merely attempts to Christianize the demonic bloodline which will place Lucifer on the throne of this world. A New Easter? Of course. The feast of the Mother Goddess, Ishtar. During the Renaissance, that medieval period when the occult traditions flooded Europe from the Mideast, Chartres Cathedral was built on a sacred site in France where ancient Druids worshipped the Mother Goddess. A World Heritage Site famous for its Gothic architecture—and, to the initiated, its thoroughly pagan symbolism—Chartres Cathedral is known to occultists as the 'Golden Book' that reinstated the philosophy of classical Greece in the mainstream of Christian Europe. The cathedral expresses through 'sacred geometry' and astrological symbolism the Gnostic belief that "Man can compass his salvation by means of knowledge", referring to gnosis. Within its massive structure was housed a mystery school which operated as a theological academy for over two centuries. In the underground crypt of the cathedral, initiates worshipped a replica of a Druidic statue known as the 'Virgini Pariturae' or 'the virgin about to give birth'. The Templar Chronicles calls the Virgini Pariturae "the Virgo who must give birth". The statue in the underground chapel was also called Our Lady Under the Earth because the crypt, where initiations took place, was believed to be connected to telluric powers, i.e. the underworld. 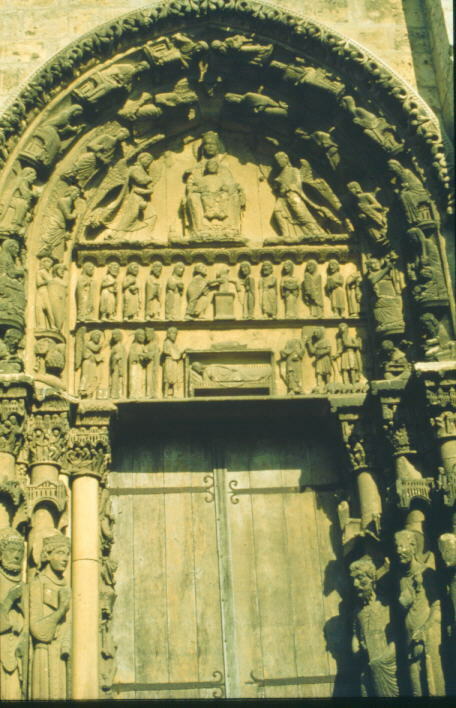 On the west front of Chartres Cathedral is featured in the tympanum of the right portal—the Gate of Birth—a statue identical to the Virgini Pariturae in the underground chamber. The exterior icon was and still is venerated by the profane masses of Catholics as Mary, the 'Mother of God'. Exoterically the white virgin on the west facade is the Blessed Virgin Mary who gave birth two thousand years ago; but esoterically, she is the black virgin who was still pregnant with child. The photos below show 'Mary' in a position identical to the other Black Virgins we have seen above—enthroned and with a child on her lap, or rather between her thighs!! The Gemini figures, representing twins, are difficult to recognize; see the left arch on a level with the twelve apostles. West Facade, Right Portal, Incarnation of Christ, 1145-55. God before Time. 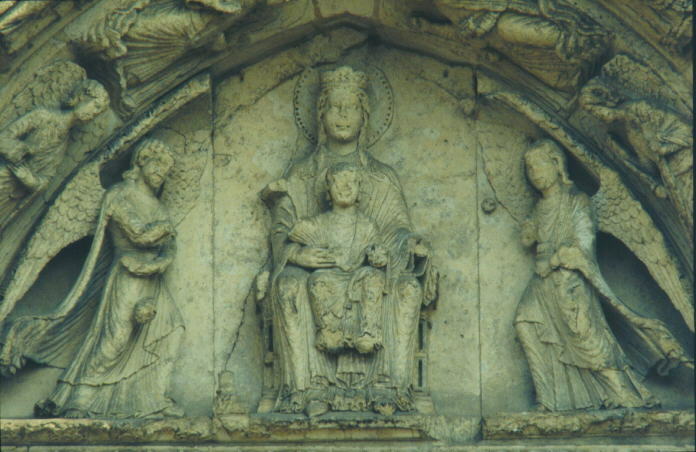 Virgin and Christ Child Enthroned. Throne of Wisdom. The occult symbolism of this most famous of the medieval cathedrals is discussed in the Masonic book, Rosslyn: Guardian of the Secrets of the Holy Grail. According to authors Tim Wallace-Murphy and Marilyn Hopkins, the seven mystical cathedrals of Europe were deliberately founded on Druidic sites dedicated to planetary oracles. There is a prophecy that, when the planets align in the same configuration as the cathedrals, the time of transition into the New Age will have arrived. The sacred site upon which Chartres Cathedral was erected was dedicated by the Druids to the Sun. Wallace-Murphy and Ms. Hopkins do not disclose that Julius Caesar also described the Druidic rites of human sacrifice that were performed on the “sacred site” of Chartres Cathedral, the principal venue of the Druid's barbaric rituals in their territory of Carnutum. “Their victims were of several kinds. Sometimes beasts; as at the gathering of the mistletoe, two white bulls; but especially beasts taken from their enemies in war; however, their more solemn sacrifices consisted of human victims, and it cannot be dissembled that the Druids were extremely lavish of human blood. Not only criminals, captives, and strangers, were slain at their sacrifices, but their very disciples were put to death without mercy, if they were wilfully tardy in coming to their assemblies. No people, however, could I think, have wrought themselves up to such a total contempt of human life and the body of man... Their human sacrifices generally consisted of such criminals as were convicted of theft, or any capital crime; and some of these have been sacrificed after an imprisonment of five years; but when such malefactors were not at hand, the innocent supplied their place. They held, that man was the most precious, and therefore the most grateful victim which they could offer to their Gods; and the more dear and beloved the person, the more acceptable they thought their offering would be accounted. Hence, not only beautiful captives and strangers, but children, and Princes, were upon great occasions, offered upon their Altars. In order to satisfy the scrupulous of the innocency of such barbarous sacrifices, and to reconcile the devoted victim to his fate, the Druids held, that the souls of those who served as victims to their Gods in this life, were deify’d, or translated into heaven to be happy there; and the remains of those who dyed in sacrifice, were accounted most holy, and honour’d before any other dead bodies. Variety of deaths they had for their miserable victims, as if they had been afraid that they should fall into a loathing, and dislike of such sacrifices, if they confined themselves to one particular manner of dispatching them. Some they shot to death with arrows; others they crucified in their Temples; some were impaled in honour to their Gods, and then with many others, who had suffered in a different manner, were offered up as a burnt-sacrifice. Others were bled to death, and their blood being received in basons served to sprinkle their Altars. Some were stabbed to the heart, that by the direction in which (after the fatal stroke) the body body fell, either to the right or to the left, forward, or backward, by the convulsion of the limbs, and by the flow of blood, the Druids (such erudition there is in butchery!) might foretell what was to come. The Virgin portrayed in the west facade of Chartres Cathedral is called the 'Virgini Pariturae', which means "the virgin about to give birth". This statue does not represent Mary or the Biblical concept of womanhood, but the archetypal goddesses of fertility and the 'feminine principle'. Since Chartres was dedicated to the Sun-God, the child of the sculpture is Horus, not Jesus Christ. The following excerpt from Rosslyn reveals how Gnostic occultism engulfed Western Christendom through the occult infiltration of the Roman Church. The pagan principle of the eternal feminine asserts that the Mother Goddess ruled over the first age of earth, corresponding to Lemuria, which supposedly achieved the highest level of civilization ever known to man. It is the same Gnostic principle which Bishop Graber and the present Pope fundamentally espouse, viz., that the divine feminine, masquerading as Mary, chronologically preceded and therefore gave divine life to her Son. As previously stated, one significant outcome of the Nestorian heresy was to give priority to the Mother Goddess, the pagan feminine archetype, over her Son. There are, however, esoteric connotations in Bishop Graber's statement, which only the initiated fully understand. "...we greet Mary as the great sign in the heavens which precedes the coming of her Son..."
Bishop Graber's prediction is generally construed as an apparition of Mary, the Mother of God. Pope John Paul II is expecting a manifestation of Mary similar to the 'Miracle of the Sun' at Fatima, Portugal on October 13, 1917. On this occasion, the sun appearing as "a solar disc...spun upon itself in a mad whirl...and whirling wildly, seemed all at once to loosen itself from the firmament and, blood red, advance threateningly upon the earth as if to crush us with its huge and fiery weight." (938) Catholics believe that a recurrence of this miracle would vindicate the Catholic Church as the 'one true Church'. Although Roman Catholics perceive this apparition as a visitation of Mary, the mother of Jesus, New Agers recognize the many occult phenomena which attended the solar event at Fatima. According to a published eye-witness account of the Fatima apparition, the sun took on the appearance of a solar disk, an ancient occult symbol of the sun. (See solar disk symbol and explanation.) On October 13, 1917, the sun would have risen in the sign of Virgo; also the Moon was in Virgo. Bishop Graber has predicted that a sign will precede the coming of Christ. And not just a sign, but a great sign! Was the Bishop referring to Virgo, the Great Mother Goddess? On Friday, October 13 in the year 1307 A.D., the Knights Templars were arrested by King Philip IV of France in collusion with Pope Clement V. Might the Fatima vision in 1917 have been a sign of the coming vengeance determined upon Rome by the Templars? Bishop Graber, whose associations include Knight of Malta, Peter Beyerhaus, may be sending an esoteric message that Virgo will be the sign in the heavens which will precede the coming of Horus, the pagan messiah who will avenge the Knights Templars by destroying the Roman Catholic Church. Should another Fatima-type apparition occur in the sign of Virgo, perhaps at Medjugorje, such an event would hardly vindicate Roman Catholicism as the 'one true Church.' To the contrary, another such apparition displaying overtly occult phenomena would probably provide the death warrant needed to overthrow this Harlot Church which has, in recent times, scandalized the world with reports of homosexuality and pedophilia in its priesthood. Since few people are aware of the Merovingian (Jewish) infiltration and takeover of the Roman Catholic Church or that celibacy, homosexuality and pederasty are sacred rites of the Merovingians, and given that the secret societies, which are under the oversight of the Prieuré de Sion, control the news media which has sensationalized these scandals, and considering the success of this ingenious and carefully executed plan, we submit that the mighty fall of this citadel of Christendom is a fait accompli.